I just started using MUX. I want to build a simple unit. It received Audio, transfers that to midi controller messages and outputs it as midi data at a midi output of the plugin. While I have read all the documentation and searches the forum and web I could not figure out how to do that. I appreciate any help and hint how to do that. What is your intended process for turning audio rate samples into event data? What do you want the events to represent? 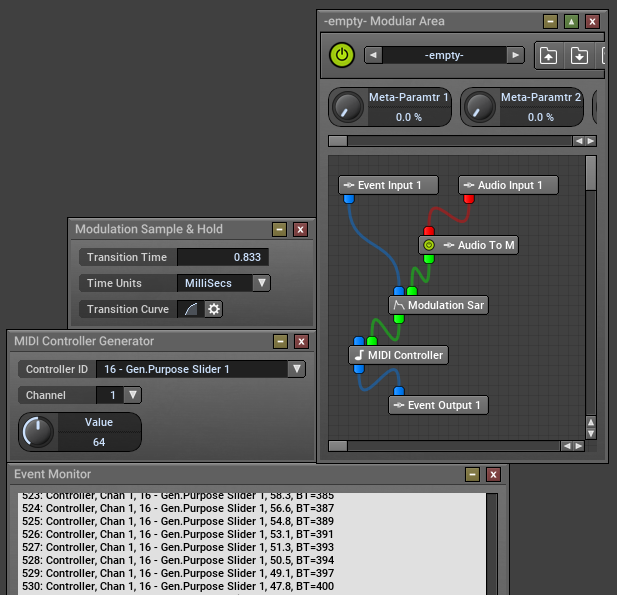 "Audio Envelope Follower" does what it says - it monitors in audio envelope (the volume, essentially) and, based on the module parameters emits a Note Event with a fixed note number and velocity and with a computed duration. "Audio To Modulation Converter" again does what it says - it converts audio rate data into audio rate modulation. Modulation then could be converted to Event data using, say, a MIDI Controller Generator with the value being modulated from the converted audio in. I've added a Modulation Sample & Hold to reduce the amount of Event data produced - but you then need to supply a trigger event.